It's only a few more days until the KLM Designs NEW RELEASE! These new images are incredible! I showcased a couple of them on my blog last week, and this week I'm going to show you a few more. I think this bunny is so sweet. 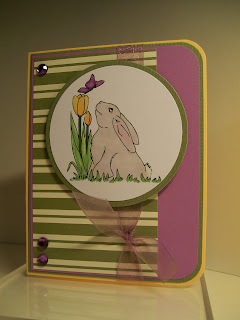 It's a perfect image for both Easter and any springtime card. The bunny seems to be enjoying springtime. I can't blame him. I am, too, as we soar into the 70 degree temperatures this week. How's that for a KLM Pile It On??? Isn't this an adorable stamp? The little boy is so cute - and generous, too! What a prized gift he's offering. He reminds me of my Brock, when he was a young boy. But you really don't want to hear the story! Trust me!!! Please Note: I have two blog posts today. Be sure to check them both out! Flower Power - Use flowers in your Creation! The flowers in my card are sublte. They are found on the designer paper that I used to paper piece the image and also for one of the layers of the background. Speaking of images, this is one of Squigglefly's new Inside Out sets. It's called Thanks for All the Support. It is a digital set that includes the image and Thanks sentiment found on the front of my card as well as the sentiment found on the inside. While I didn't go with the traditional pink color, I think the Thanks for All the Support image set would be perfect for breast cancer types of cards. My online friend Viv is raising funds for Breast Cancer Awareness. One way she is doing that is by selling cards. I am going to use this image set to make some cards to send to her for her fundraising efforts. If you'd like more information about Viv and her support of Breast Cancer Awareness, check out her blog. Be sure and check out the Squigglefly store, too. There are a lot of wonderful new images, including some other Inside Out sets. I also hope you'll participate in this week's flower challenge. You know what that means... another card created with a Sunshine and Giggles image. For this week's card, I chose the Serenity image, which features two sheep grazing in a field of flowers. I thought this could easily be used for an Easter card by adding a Happy Easter sentiment. May your day be filled with Sunshine and Giggles! This week's challenge is an INSPIRATION Challenge. 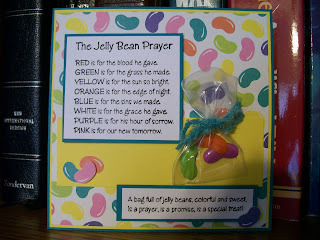 Participants are asked to use the Jelly Bean Prayer as the inspiration for their card/project. Think, Easter, spring, rainbows, jelly beans... etc. 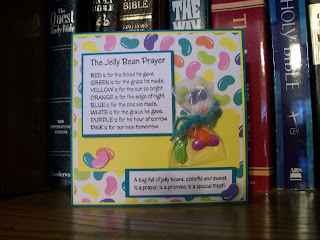 I happen to own a Jelly Bean Prayer stamp set (TAC) so I decided to use it for my card. 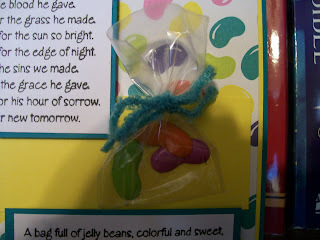 I teamed it with some overall jelly bean designer paper and cut out some little jelly beans from the paper to add to the card. 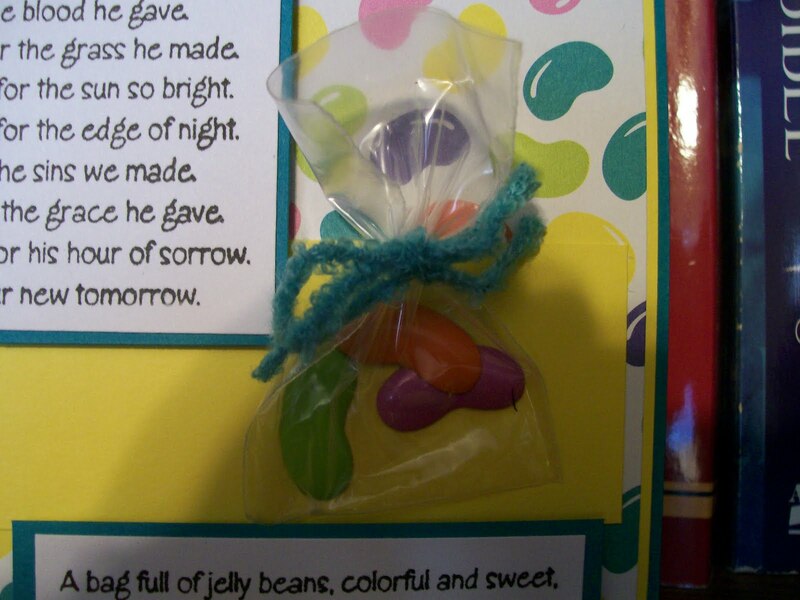 My favorite part of the card is the cute little bag of jelly beans I created with a clear plastic bag and some jelly bean shaped brads. Are you up for the challenge? 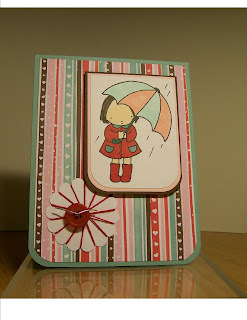 If so, create your card based on the inspiration and post a link on the Crafty Ho's Challenge Blog. I can hardly wait to see what you come up with! Sew Many Cards is delighted to have Wags 'n Whiskers as the sponsor for this week's Sew Many Cards Challenge. This week's Challenge theme is "Let's Punch It". Participants are asked to create a card using a Sew Many Cards image and at least one punch. The winner will receive a nice prize from Wags 'n Whiskers! Lacey generously provided the opportunity for me to create with one of the Wags and Whiskers images. Easter Blessings is a rubber stamp. The image measures 2.7”H x 3.9”W, a wonderful size for coloring and creating cards and other paper crafting projects. It is an adorable image of a boy and a girl and their basket filled with two bunnies. I used lots of circles and dots on my card, including a large punched circle, cardstock dry embosses with the Cuttlebug Swiss Dots embossing folder, Stampin UP! polka dot grosgrain ribbon, and even two brads that have dots on them. Sew, what are you waiting for? Don't you want to head over to the Sew Many Cards store and get an image so you can create a punched card for the Sew Many Cards Challenge in hopes of winning a prize from Wags 'n Whiskers??? TOOL CHALLENGE -- LET'S PUNCH IT! Use a punch or punches on your project. 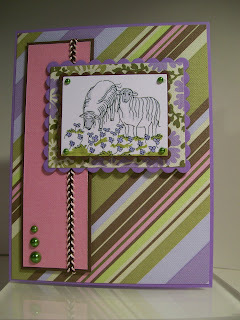 The Sponsor for this week's Sew Many Cards Challenge is Wags 'n Whiskers. 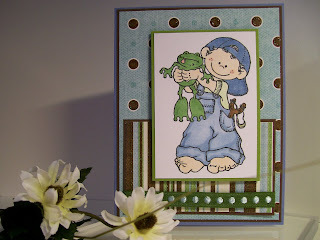 I was a stay-at-home mom for 7 years so stamping was a great way for some “Mommy time”. But after stamping for over 2 years, my hobby became my obsession…so my obsession became my dream! Now I own an on-line store! 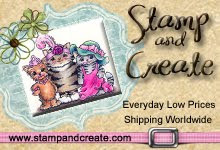 Stamp and Create is a new on-line store carrying many popular brands of stamps, paper, and embellishments including: Wags ‘n Whiskers Rubber Stamps, High Hopes Stamps, Kraftin’ Kimmie Stamps, Whiff of Joy, Stampavie, Penny Black, The Greeting Farm, Basic Grey, 7Gypsies, Shimmerz, Nestabilities (always 20% off!! ), charms and more!! To learn more about the generous prize package and the details of this week's challenge, be sure to go to Sew Many Challenges. I've created a card using the Sew Many Cards Jovi image. Jovi is an adorable bunny, so sweet!! I used a Martha Stewart border punch to create a row of flowers, meeting the Punch requirement for the challenge. 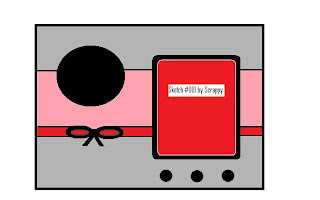 I also used a simple hole punch to thread the ribbon behind the image. Soft and beautiful designer papers coordinate nicely with the soft coloring of the Jovi image. I hope you'll create a card with punch and enter this week's challenge! As I promised in yesterday's blog post... here's another KLM Digital Designs SNEAK PEEK! That being said, I think this KLM Daisy Rat is ADORABLE! Such a sweet image with the cute rat holding that pretty daisy in its dainty little hands. PRECIOUS! New Releases will soon be available at KLM Digital Designs, so it's time for some sneak peeks. For my card I used two images - Basketball Player and Cheerleader. These are both part of the new releases that will be the first of January. There are several fun images that will be available. I'll be posting more sneak peeks tomorrow, so be sure to come back then and check it out. Sew Many Cards is pleased to have Cornish Heritage Farms as a Sponsor this month. Cornish Heritage Farms has been extremely generous in their prizes for the Sew Many Cards Challenge winners. They have also generously donated stamps for the design team members to create with. I was so excited to get a new release Cornish Heritage Farms stamp set to work with for today's post. It is an awesome set called Emerging Dolphin - Smile. I would like to express my sincerest heartfelt appreciation to Cornish Heritage Farms, personally for the stamp set I received and on behalf of Sew Many Cards as well! The Emerging Dolphin stamp set includes the gorgeous dolphin image as well as a stamp that says Friendship and another one that is a quote from Phyllis Diller, "A smile is a curve that sets everything straight." I wanted to showcase the dolphin image, so chose to use a joy-fold for my card layout. The dolphin image was stamped directly onto a piece of designer paper that has small specks on it, resembling air bubbles in the water. To coordinate with the image, I also used some seashell designer paper. 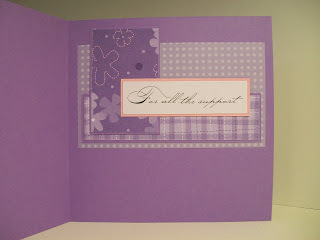 I went with three pearlized purple brads as the classic embellishments for my card. I used the Phyllis Diller quote on the inside. I wish I could show you a picture of the inside of the card, but my camera is being difficult this evening. I'm sorry! This has been such a fun project. I cannot thank Sew Many Cards and Cornish Heritage Farms enough for the wonderful opporunities they have given me! Please NOTE! I have two blog posts today - this one and the Squigglefly Challenge post that follows. You won't want to miss either one, so be sure to keep scrolling! The sun is shining! Spring is here!!! This is one of the first Sunshine and Giggles images I ever created with and I still love it. It is so cute. Tess is lovingly offering her friend Dolly a carrot treat. This is a scene perfect for Spring! I used multiple layers of some bold designer papers for this week's card, so only added a minimum of embellishments. You may have noticed that I've tried to step outside of my box and try something different for me. It may be a new coloring technique, a new feature, a new way of using an image. This week, it was all about the bold papers and that adorable image of Tess and Dolly. I appreciate Janice, the creator and owner of Sunshine and Giggles stamps, for allowing me to create outside the box each week. Janice is the best! Squigglefly Button, Button, Who Has the Button? This week's Squigglefly Challenge is all about BUTTONS! Anyone can play along Create a card and post a link on the Squigglefly Challenge blog... but don't forget the button(s)! For my card I used a BRAND NEW Squigglefly image created by a BRAND NEW Squigglefly artist, Diane Carubia. Welcome to Squigglefly, Diane. I love your Rabbit with Sunflower image and can't wait to see what you will be creating in addition to this adorable image! There are actually a lot of new things happening at Squigglefly. If you haven't been to the Squigglefly site, you really should check it out. On Friday, Squigglefly announced their new line of images - Inside Outs! These will be released on Saturday and I can't wait. I am so excited about the creative possibilities of this new line of images. These Inside Outs! sets will contain images and sentiments to create a card from the inside out. Typically, they will contain two images and two sentiments, one of each to be used on the inside of the card, and one of each to be used on the outside of the card, all available in one easy package! Isn't that cool?!?!? And if that isn't cool enough, Squigglefly is also offering a way for bloggers to win a free Inside Outs! image pack. It's easy! All you have to do is create a card using a Squigglefly image, post it on your blog and post the link on the Squigglefly site. Check out the details on the Squigglefly Inside Outs blogpost!!! Don't forget to play along with the Button challenge, too. Lots of exciting things going on at Squigglefly! 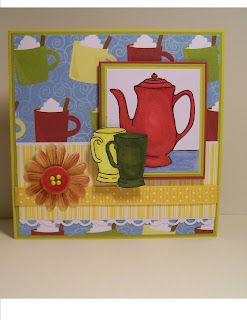 It's time for another Challenge at the Crafty Ho's Challenge Blog! 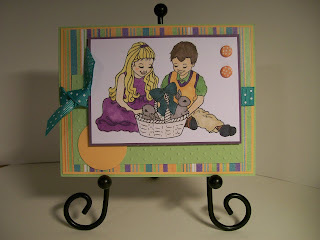 Please join the fun, create a card based on the sketch and post a link on the Challenge Blog. I'd love to see what you come up with! Here's the card I created, using the sketch with some minor adjustments. 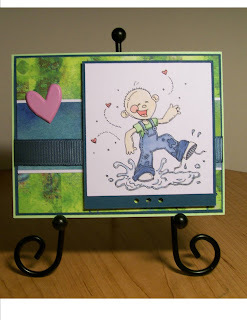 I used the Meljen's Designs Mud Puddle Boy digital image. I love this image! It reminds me of my son Brock. Brock is a big guy now (over 6 foot tall), but he was once a little tyke, cute as the dickens, and he loved stomping through puddles! Who am I kidding? Brock still loves stomping through puddles. It is not unusual to see him go out of his way to find a puddle to stomp through. He derives great joy out of it, too, just like the little guy in this image. I'm not home... I'm actually at a Stamping/Scrapbooking Retreat! I'm having a blast - no matter what the weather is. I wish you were here with me!!! 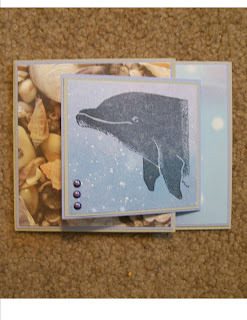 But since you aren't, I've left a fun card here on my blog for you to see. Please note: I have two blog posts for today. Please check them both out! Thank you! It's time for another Sew Many Cards Challenge! Sew Many Cards is honored to have Cornish Heritage Farms as the sponsor of the challenge. Cornish Heritage Farms (CHF) is owned & run by Richard & Liz Pomeroy. Why the name? Richard & Liz are originally from Cornwall, England hence the Cornish Heritage & the 'Farms' is the 100 acre farm in north central Montana where they live & where all the stamps are manufactured. Richard & Liz believe in producing a high quality product so all the stamps are deeply etched, red rubber. CHF is a diverse stamp company in the fact that it consists of a variety of different licenses & styles, ranging from very detailed (Thomas Kinkade) to simple line art (Tom Fun Collection) therefore offering something for everyone. The Cornish Heritage Farms sponsor prize package features three new release stamp sets. 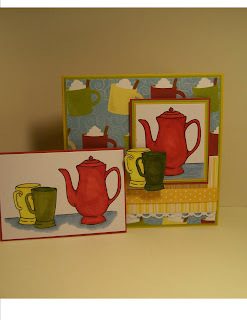 These can be seen on the Sew Many Cards Challenge blog. The blog also gives the details of the challenge, including some samples by the design team and information on how to participate. Be sure to check it out and play along, too! What does SPRING mean to me? It means warmer temperatures, sun bonnets, and flowers. This little lady is all decked out in her beautiful spring hat and pearls. She is just too too cute! I embellished the card with some delightful paper flowers (they're from the bridal section at Michael's) and some pearls to match Halen's necklace. 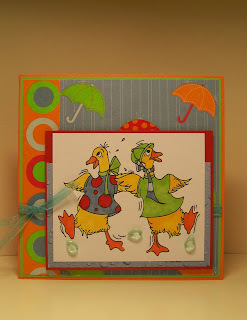 Now, how about playing along with this week's Sew Many Cards Sketch challenge, showing us wht Spring means to you. It's going to be fun! 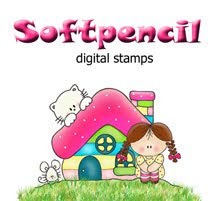 Sew Many Cards is so fortunate to have Softpencil Digital Stamps as a Sponsor this month. "Hello everyone! my name is Elizabeth Pujalka and I´m the illustrator and designer behind Softpencil -Digital Stamps, home of Michu and his lovely friends, where you can find cute illustrations for your crafting needs. My illustrations are a homage to the Nature and their creatures, where a sweet child, a simple flower or a fragile animal become protagonists." Elizabeth provided a generous prize package to the winner of the March New Release Blog Hop. Thank you, Elizabeth and Softpencil Digital Stamps! Today's card features one of the adorable Softpencil digital images - Taking Care of Flowers. If the layout looks familiar, it should. 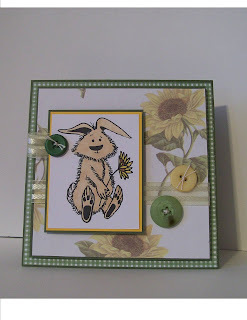 I used the sketch for this week's Sew Many Cards Challenge to create this springlike card. The colors are a bright and cheerful mixture of designer papers, bold buttons, and fun ribbon. At the center of it all is the cute Softpencil image. I used a plaid paper to resemble tile on the bottom of the card and a bubble print for the top with a border of checked ribbon in between. It almost looks like a bathroom wall, don't you think? I hope you're wearing GREEN! I was always a bit mischievious as a child, still am, for that matter... so when St. Patrick's Day arrived I wear just a teeny smidgen of green. I guess I was tempting fate. I don't know why... because getting pinched is no fun. In celebration of today's holiday, I've created a very simple St. Patrick's Day card, using the KLM Lucky Cap image. This is by far my favorite image suitable for this holiday. I love it. I hope it's a pinch-free one! The snow is melted! I didn't even have to wear a jacket when I ran errands yesterday! Woo Hoo!!! 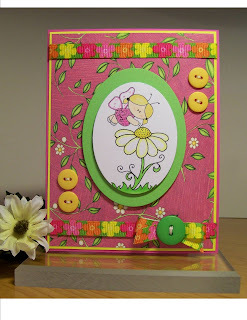 To celebrate, I've created a Spring card for the Craft Critique Spring Blog Carnival. I'm so glad SPRING IS HERE!!! Please note: I have two blog posts today... so be sure to keep scrolling. You'll want to see the Sunshine Monday one, too. It's a cool AGED COPPER card. This week's challenge is a SHINY one! Yes, that's the special feature. Challenge participants are asked to include something shiny on their cards! What's shiny on my card? It's the diamonds - ummmmmmmmm, I mean RHINESTONES. A Girl's Best Friend! For my card I chose to use one of Squigglefly's newest images. I love love LOVE it! This digi set actually includes two dresses and multiple sentiments. It's called Sew Fabulous. Have I mentioned that I love it? I decided to paper piece my dress rather than color it. I love how elegant it looks. I also cut out one of the tiny flower blossoms from the designer paper and used it as a decoration on the waistband. I added another flower blossom on the sentiment oval. This is a fun challenge. I hope you'll play along. I'd love to see your shiny creations! I love creating with Sunshine and Giggles images... and every Monday I get to show you what I've been working on. For today's card, I printed out one of the Cody and Friends images on white cardstock. Yes, I did say white! It sure doesn't look white, does it? That's because I then sponged sand-colored ink all over the image and took a clean unused Aquarium filter to speckle copper onto the image as well. I also sponged copper ink onto the edges of the image to give it an aged feel. The background paper is an actual page from an old dictionary I have. I backed it with black cardstock and a piece of copper cardstock, too. The embellishments add more aged copper to this vintage card. It was a fun one to create! I used an oldie but goodie Stampin' UP! stamp set for my creation - Patterns of Friendship. 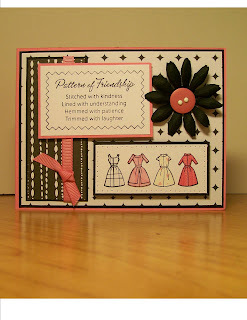 My pink and black card incorporates stamping, paper piecing, paper piercing and a host of embellishments, too. I hope you will play along in this week's challenge... be sure to post the link of your creation on the Crafty Ho's Challenge Blog. I'd love to see your PINK and BLACK card, too. 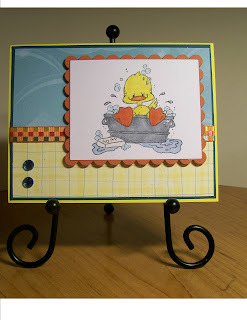 I was recently challenged to pull out a stamp (or stamp set) that I love, but have not used in a while and to create a card for a friend with that stamp set. 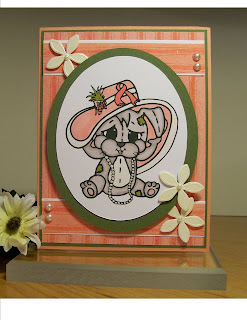 This challenge took me back to my Stampin' UP! collection of stamps - I have many! When I first got started in stamping, Stampin' UP! was my go-to place for stamps. Now I have many favorite companies and never enough money to buy all the stamps I would like to have. LOL! The stamp set I used is a retired one, but a fun one. As you can see, the focus of my card is Man's Best Friend, his dog. While the sentiment is stamped from this oldie but goodie Stampin' UP! stamp set, the striking feature of the card is the dog I created using a variety of paper punches. 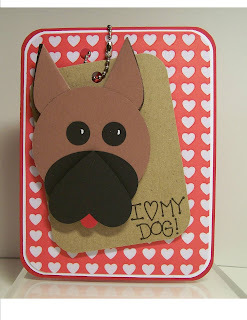 To complete the look of the dog tag, I used a chain clasp for the embellishment. While the picture doesn't show it, there is a stamped pawprint on the inside of the card, too. It was fun to create this card. I really like making things out of punches. I hope you like it. Sew Many Cards is delighted to have Stamps Alive sponsoring this week's challenge! Terri Olson, the owner of Stamps Alive, has offered a generous prize package for the Challenge winner. I started my business in 1993 to give me something to do. I had worked all my life and recently quit to be a stay at home mom to my new baby. I've always been interested in paper products and I didn't like paying full price for some of the things I wanted. So I started my business. I like to pass my savings on to others. I've made some really good friends over the years. I've always been a small business I only advertise word of mouth. Over the years I've kept as busy as I wanted to be. It has been very interesting to see the hobby industry change over the years. I had a "scrapbook" store in my basement before Las Vegas knew what a scrapbook store was. I've dealt with Provo Craft the entire 17 years I've been in business and that has been fun, to watch them change!! Thank you for providing quality products at a reasonable price, Terri! The longevity of your business speaks volumes to paper crafters! 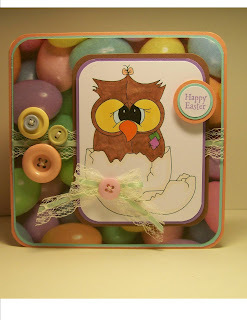 In keeping with the Easter theme for this week's challenge, I made a card using the Sew Many Cards Olivia in Egg image. Don't you just love Olivia's face? So sweet! I had some really fun pastel-colored Easter egg designer paper and I thought it coordinated perfectly with this image. For embellishments I used some sewing items - lace, ribbon, and buttons. 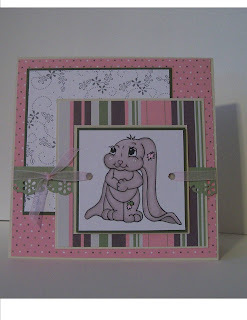 I always think these go nicely with the Sew Many Cards images. The sentiment Happy Easter completes the card. I'd love to see your Easter cards, too. 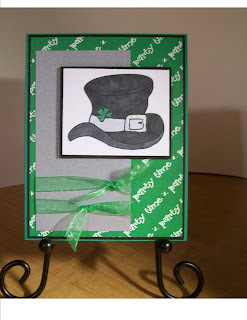 Be sure and create one soon and post the link on the Sew Many Cards Challenge blog. And good luck! I hope you win the Stamps Alive prize package! Today I am featuring this wonderful KLM Designs Tall Tea Set image! 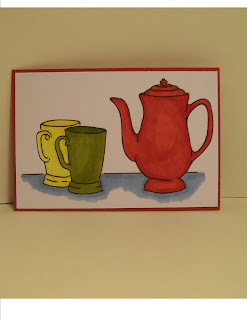 I have been drinking hot tea a lot this winter - it's a refreshing treat on a cold winter day - so I was immediately drawn to this tea set when I first saw it. I colored it with my Copic markers and thought it was warm and inviting. Then I started creating my card and decided I wanted a little bit different look to the image. Not a problem, even with digitals. I cut the tea pot into a block and then cropped/cut the two mugs separately so they could be overlapped and popped up off of the teapot. I love the dimension this created to my card. You may notice that the table-line is extended on the altered version. I did that with my Copic multi-liner pen. It was not at all difficult. I'm including two more pictures that show both of the colored images so you can see what a difference this one small touch made in the overall look. It is fun to think outside the box when using digitals. The button I used is a recycled one - it came off of a worn out piece of clothing - so this card fits this week's Spoon Full of Sugar Challenge. KLM is the challenge sponsor this week and is offering a prize of 3 digital images. Oh, and one more thing... that gorgeous flower? I airbrushed it with two colors at the Copic Certification class I took on Saturday. Isn't it pretty? This week's Squigglefly Challenge is to create a scene! No, not in public... on your card! I hope you'll play along with this challenge. You can find all the details (and some incredible samples by the Design Team) on the Squigglefly Challenge Blog. The challenge started on Monday, but you still have a few more days to create a scene and link it to the Squigglefly Challenge Blog. Who knows, YOU might be the one who wins the challenge. The prize is a free Squigglefly image. I created a night scene, complete with a full moon, a tree and the adorable Squigglefly Wise Owl image. I cut out the owl image and added some dimension by popping the owl's eyes and some of the leaves up off of the main image. 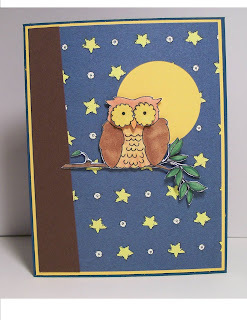 I chose not to use any embellishments on this card (I can't tell you the last time I did that). That was a challenge for me, but I think it worked okay. LOL! It was a lot of fun to create a scene! Won't you create one, too? 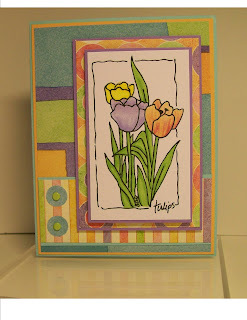 Sew Many Cards is proud to have KLM Designs as a sponsor this month. I am especially excited about this because I am privileged to serve on the design team of both of these marvelous companies. That means I have a good reason to create with both Sew Many Cards images and KLM Designs images each week. How fun is that!?!?!? Kathryn, the owner of KLM Designs has generously donated an incredible prize package to the winner of this week's Sew Many Cards Challenge. The winner will receive 3 KLM digital images of her choice! Wow! Who wouldn't want to win that? 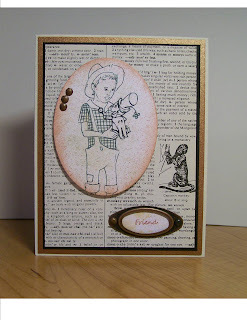 So be sure to create a card/project for this week's challenge - it's all about boys! 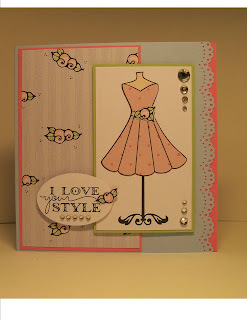 The details can be found on the Sew Many Cards Challenge Blog. KLM carry’s a large selection of designs from clowns, which are the company’s signature design todigital sentiments. All images are delivered ZIP format. Each image file contains JPEG and PNG format files. Images can be resized, reversed and altered to your likings. My card for today was created with the KLM Designs Tulip Window image. I actually colored this image during the lunch break while attending the Copic Certification Class this past weekend. I was practicing some of the techniques that Lori and Sharon were teaching us. The yellow tulip and the leaves were both colored in much the same way I've been using my Copic markers I colored them with a lighter color, then outlined with a darker shade of same color. Finally, I colored them again with the original lighter color to blend the two together. The lavendar tulip was colored using a feathering gradient technique. With this technique I took a lighter shade of lavendar and colored from the top downward. I then took a slightly darker shade of the same color and colored from the bottom upward, blending the two shades together. The peach tulip (which is my favorite one) was colored iwth a tip-to-tip blending method. With this method I added a bit of dark color to the tip of a light-colored marker by touching the two tegether. I then colored fromthe bottom of my tulip upward, reapplying darker ink to the light-colored marker as needed. Thanks for checking out my blog post. 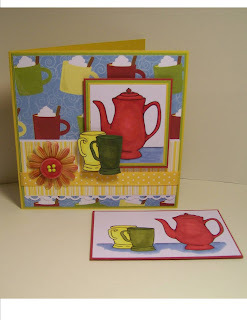 I'd love to see one of your creations, too, in the Sew Many Cards challenge. Sunshine Monday - Time for Some Golf! 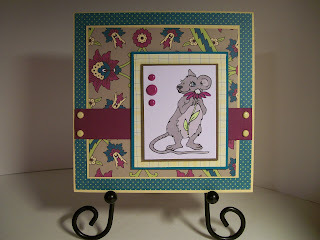 Squigglefly Challenge - Fun Borders!